We will visit OTC2018 at HOUSTON,USA in May 2018. SHINEQUIP is leading oilfield production equipment, well servicing equipment and well drilling equipment supplier around the world. We are exclusive agent for the ISO certificated and API certificated plants. We locate right in the heart of Sheng Li Oil Field, Shan Dong, CHINA, the largest oil field base in eastern CHINA. SHINEQUIP provides excellent oilfield production equipment, well servicing equipment and well drilling equipment for international operators and contractors. We keep focusing on oil&gas industry supply. We are searching for new technology to help our customers lower their oilwell and gaswell operation costs constantly. Combined with our ingenuity, our strategic locations, professional and highly experienced workforce we have gained good comments and trust from our international customers. SHINEQUIP is the smart choice for your onshore and offshore oilfield material supply. 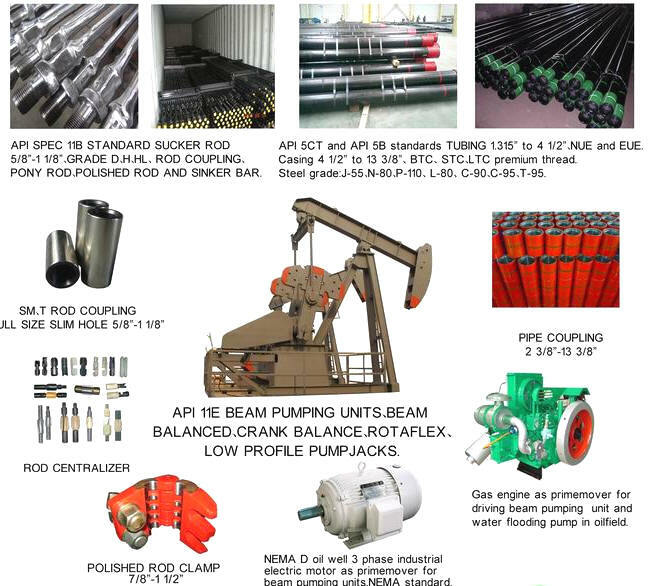 Production equipment API11B Sucker rod and standard pony rod, polished rod and rod clamp, rubber rod guide, rod BOP,API11E Beam Pumping Units, Low profile pumping unit,API5CT standard Tubing, Casing ,coupling, pup joint and special designed VAM,NEW VAM, VAM TOP, HYDRILL advanced thread casing. Drilling rig tools API8C, 8A standard CANVINS tubing spider, BJ, VARCO style Tubing Elevators, casing slips, wooley slip, Baash Ross casing spiders, Guiberson spiders, oil saver, mud saver, sucker rod stripper, rubber rid guides, master bushing, FOSTER, RSX hydraulic power tong and FARR hydraulic casing power tong, McCoy INTERCHANGEABLE CASING POWER TONG, hydraulic power station. Well servicing and Drilling equipment Well service plunger pump apply for cementing, well flushing, mud displacement, sand flushing, pressure testing, sealing separate squeezing,triplex pump for water flooding operation. F series, Gardner Denver Mud pump, mud pump spare parts for Brewster, Continental Emsco, Ellis Williams, Gaso, Gardner Denver, Liners, Pistons, IDECO, National, Oilwell, OPI, Skytop, Wheatley, and Wilson. DEMCO gate valve, DEMCO butterfly valve, wellhead component,, API5D Drill pipe and drill collar, Diesel and Nature Gas engine, Generator. PPE and safety equipment: we provide complete protection for oil workers in top class standard. We have provided high quality ASTM standard OIL SPILL CONTROL GEAR, include solid float booms, rubber inflatable oil booms, absorbent boom and absorbent pad to environmental company to deal with the biggest oil spill in GULF OF MEXICO. We also provide GB5099, DOT, ISO standard GAS CYLINDER, oxygen and acetylene gas cylinder. We are SONCAP certificate holder. SONCAP CERTIFICATE NUMBER, COGZH023328. We are able to provide standard products according to customer’s requests. Our products apply the strictest international standard. We are able to provide third party inspection report according to customer’s requests. Honesty, dedication, learning, innovation are the core value of SHINEQUIP working principle. We expect to grow with you together.